Happy Monday Friends! I'm more excited by Monday than usual (which doesn't take much) because I'm having a few friends from work over for a festive holiday feast tonight. Obviously, I love a good dinner party, but the holidays make everything feel that much more exciting. When I'm cooking, dessert is usually an afterthought. I get so focused on appetizers and sides that dessert is typically assigned to a guest or just nonexistent. This time, a few friends are bringing sides so I had more time to think of something festive to serve. Creme Brûlée is the perfect party food. 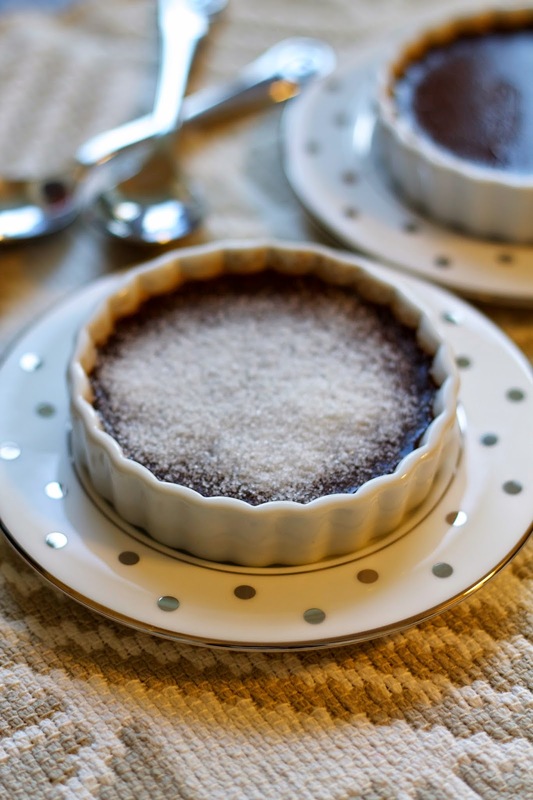 This chocolate version adds a decadent twist on the classic, creamy custard, and of course has that burnt sugar crust we all know and love. 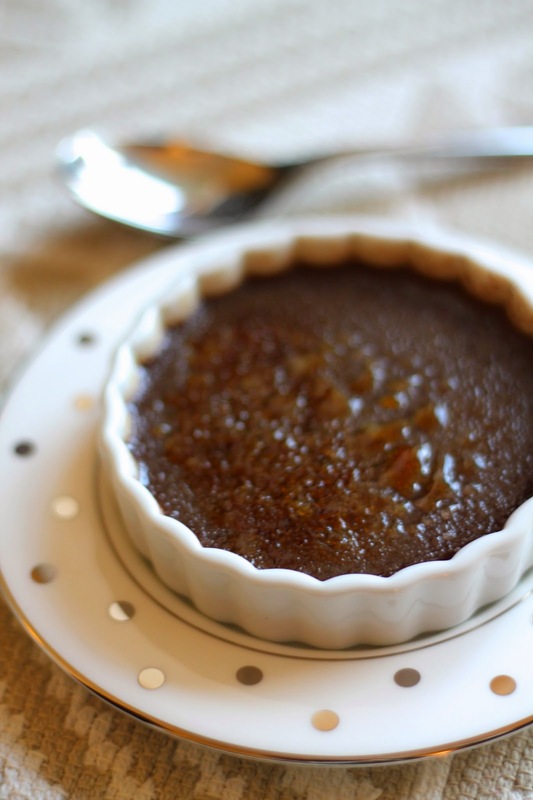 The best part is that Creme Brûlée, besides the simplicity of making it, is that it's the perfect make-ahead dessert. I made it yesterday, chilled it, and then tonight each guest can brûlée the top off their own dessert. Let's be honest, the opportunity to play with fire just took your dinner party to a whole new level. Preheat the oven to 250, and set some water to boil on the stove. In a separate sauce pan, combine heavy cream and 1/2 c. sugar. Heat over medium low, whisking constantly, until sugar dissolves. Reduce heat to low and whisk in chocolate. Continue whisking until the chocolate is totally combined. In a bowl, combine egg yolks with 1/3 c. sugar and whisk well. While whisking, add 1/2 c. of the warm chocolate cream mixture to the eggs (this is called tempering the eggs - slowly warming them so they don't scramble). Continue adding chocolate a little bit at a time, then add the rest once the egg yolks and chocolate mixture is slightly warm. Whisk well to combine. Transfer chocolate mixture into 10 (4 oz.) ramekins. Add the ramekins to a casserole dish, then pour boiling water into the pan so that it reaches about half way up the ramekins (this is called a water bath, which helps custards cook through without cracking), being careful not to splash any water in the custard dishes. Bake until the custard just sets (between an hour and an hour and 15 minutes). Remove the custards and let cool on a wire rack. Transfer to the refrigerator to chill. To serve the creme brûlée, sprinkle 1 teaspoon of granulated sugar on top of each dish. 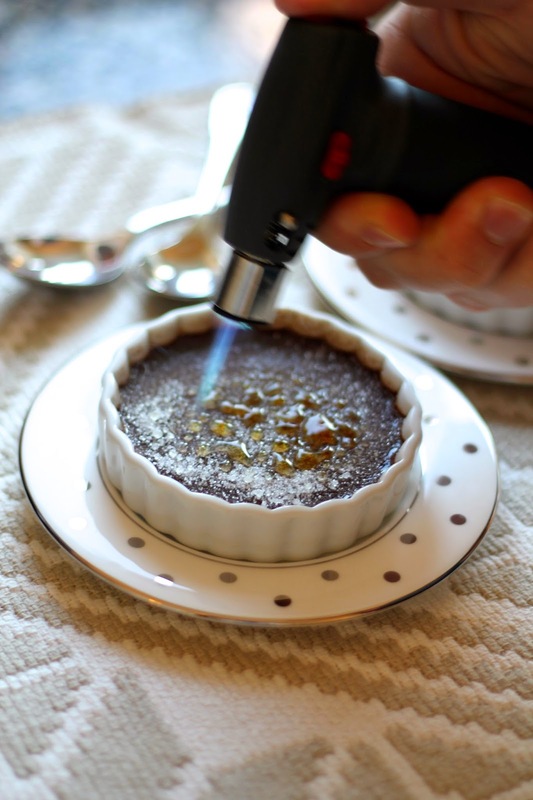 Use a kitchen torch, continuously moving back and forth, to burn the sugar. Enjoy!